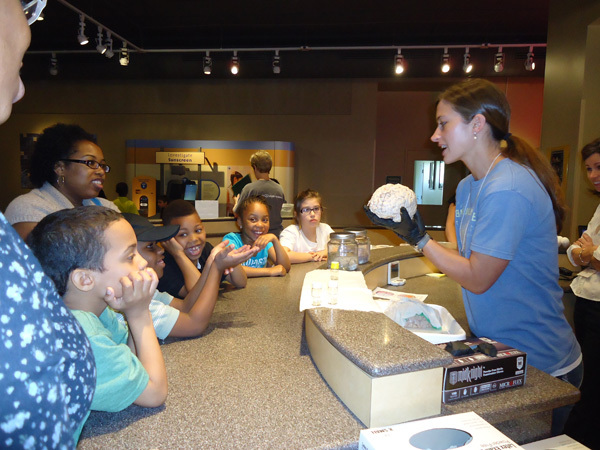 A museum volunteer shows an ACTUAL HUMAN BRAIN -- ewwwwww -- to some kids. Guest post by Sandra Ackerman, Duke Institute for Brain Sciences. Cries of “Eew!” and “Squishy!” and a fair amount of giggling marked the arrival of Brain Awareness Week at the North Carolina Museum of Life + Science last week as it offered visitors some great hands-on activities. 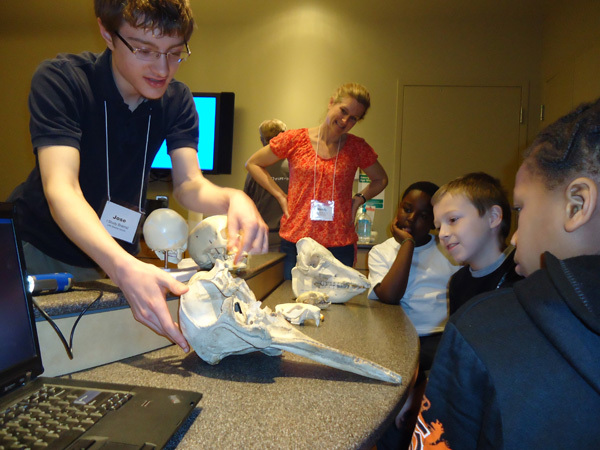 The museum’s second floor demonstration lab became the Brain Lab, where kids and adults learned about the three layers of protection that nature has provided to our brains. First the visitors examined half a dozen animal skulls and tried to identify them. There was a beaver, a boar, a deer… What was that huge one, a toothed whale? No way! The next step was to check out a few specimens of preserved brains, each tightly encased in the tough membrane called the meninges. The most courageous or curious visitors even got the opportunity, after donning latex gloves, to touch the surface of a human brain—an experience they will not soon forget. Finally, for the purpose of active experimentation, each lab visitor was given a raw egg in its shell, representing the human brain within the meninges. If the egg was shaken vigorously inside a plastic container (the “skull”), the shell often cracked, spilling its precious contents. However, after adding water (“cerebrospinal fluid”) and a new egg to the container, a participant could shake the container or even slam it down on the counter, most often with the result that the egg just bobbed gently in the protective liquid. In cases of extreme trauma, the eggshell sometimes cracked after all—thereby showing vividly why cyclists and skateboarders should always wear a fourth layer of protection, a helmet. Skulls were compared for their relative brain cases. Nearby, kids wearing vision-distorting “prism glasses” took turns throwing sponge balls at targets marked on the wall. Before putting on the glasses, most participants took a few tries to hit the target, then quite a few more to home in on it while their vision was distorted by the prisms. What really shocked them, though, was how hard it was throw accurately once they had taken the glasses off again. “You think it’s dumb?” her mother asked, surprised.